Really good steak sandwiches. Good fries too. Closed on Sundays however. No inside seating - almost like a drive up or walk up sandwich shop. the sauce - sucked. the bun - sucked. the taste - not anywhere what it was advertised. was supposed to be a philly cheese steak ; It was a cheese steak! philly ... not so much. to say the least - not good. Good food - Philly style ! Great little stop along Rt 422 in Sinking Spring. 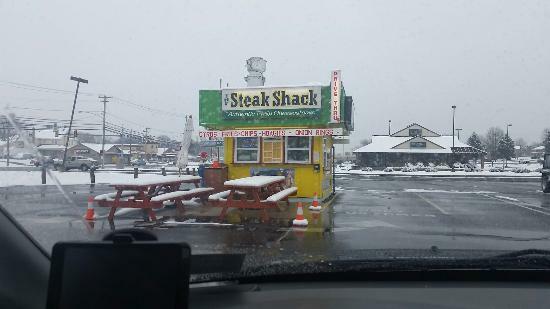 Great Philly style food - just place your order and wait for your number to be called from the shack. Well worth a stop ! Philly Cheesesteaks in Berks County! If you are looking for a delicious cheesesteak but don"t want to drive to Philadelphia to get one, the Steak Shack is your answer! The prices are reasonable and the food had me wishing for more. The beast cheese steaks and home made potato chip fries! See the title. You will not be disappointed. Just wish it was open Sundays and had indoor seating. The bread is amazing and brought in fresh daily. The steak sandwiches are better than anywhere in Philly. Do yourself a favor and drive 10 minutes to visit this little gem. You no longer have to drive to Philly to get a decent cheese steak - the Shack has got you covered. Everything is great from the meat to the fresh rolls! Get quick answers from The Steak Shack - Sinking Spring staff and past visitors.